I’ve just started to follow along the December mini-course and blog hop for The Journey Within, a year long hand-made art journal online class with Kiala Givehand and 18 guest artists. It’s a great way to warm up for the prompt I’ll be contributing right here on December 17, as well as my video/s and techniques I’ll be contributing for part of the July 2016 portion. 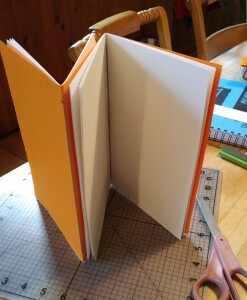 Here’s my empty book I created for the December Mini-Course. The mini-course is actually available to purchase right now, however if you sign up for the 2016 course, you get it for free! I thought Kiala’s instructions via video AND print were done really really well. Easy to follow, and she went over steps as she created the book. It’s the perfect journal structure for a month of prompts or if you’re following the blog hop! Of course, I couldn’t leave it blank for too long, even if I haven’t had much time this week. I decided to work on the first two blog hop prompts to start my journal. On the left is my attempt at Mimi Bondi‘s challenge. 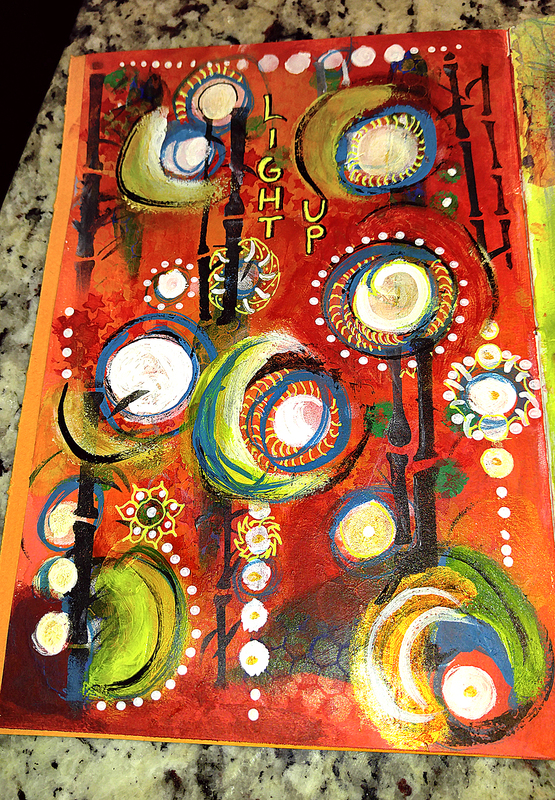 I really enjoyed playing with the layers, stencils, and different paints as well as adding in vertical elements as interest. Her colors are really vibrant, but I had fun making this pop and following her video but with my own supply of paints and inks. 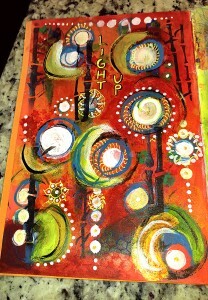 On the right above was my in-progress look at my take on Cindy Gilstrap‘s challenge from Dec 2. After viewing her video, I chose to concentrate on using some special bits of handmade paper I had laying around. The center piece, corner pieces and bottom blades were from a gossamer thin piece of light green paper with lots of threads and inclusions that I first spritzed well with a red color spray which was then cut into various shapes. I loved playing with the handmade papers ripped into pieces, and collaged in place. 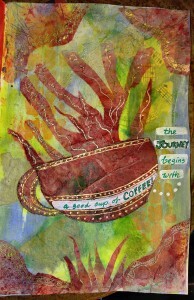 In the end it reminded me of a very hot cup of coffee from somewhere in the tropics, so I added my “journey” phrase : “the journey begins with a good cup of COFFEE!” and tangled some of the edges with a gold gel pen (I’m a bit addicted to gold!). I’m looking forward to doing a few more of the blog hop challenges as I can! 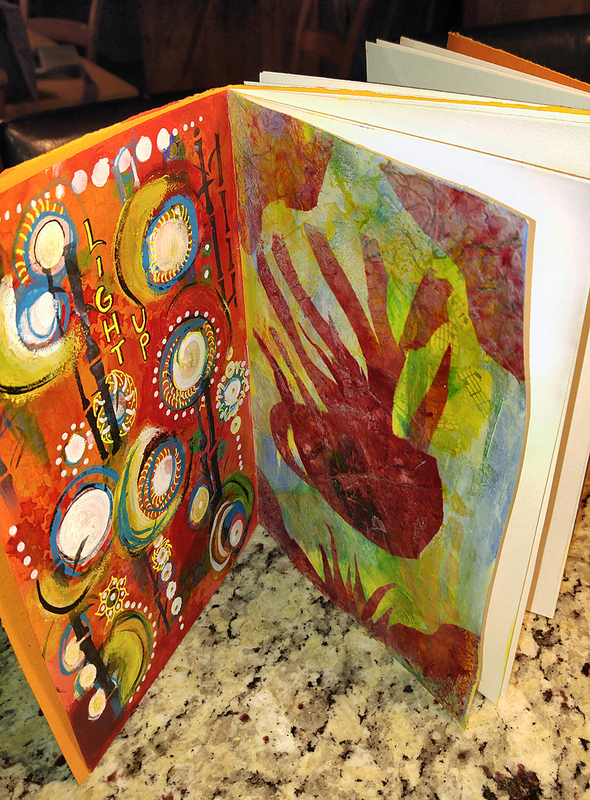 If you’re looking for a wonderful opportunity with art journalling and also to make 12-13 of your own journals over the next year, you can sign up for the Journey Within 2016 year of handmade art journal course with prompts and techniques from over 19 artists HERE! And keep your eyes out for MY Dec 17 blog hop prompt! And there will be some giveaways, so subscribe the blog or the Facebook page! 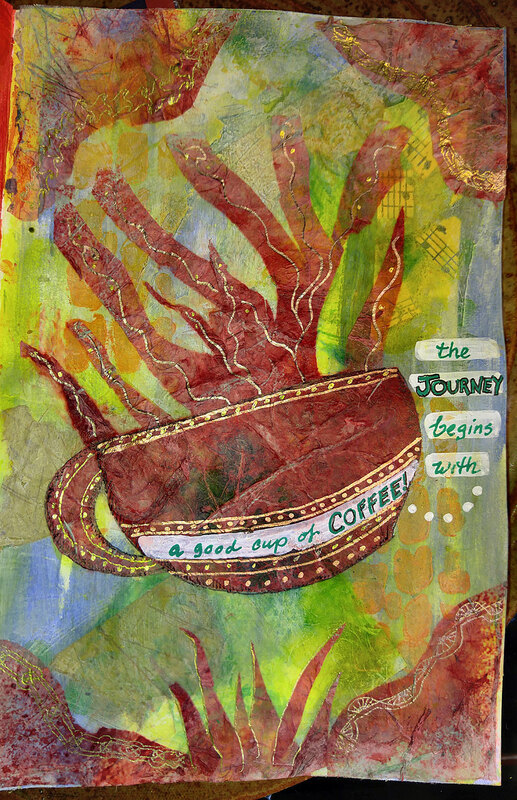 This entry was posted in Art Journal, Book Arts, Challenges, The Journey Within and tagged art journal, art journaling, The Journey Within. Bookmark the permalink. 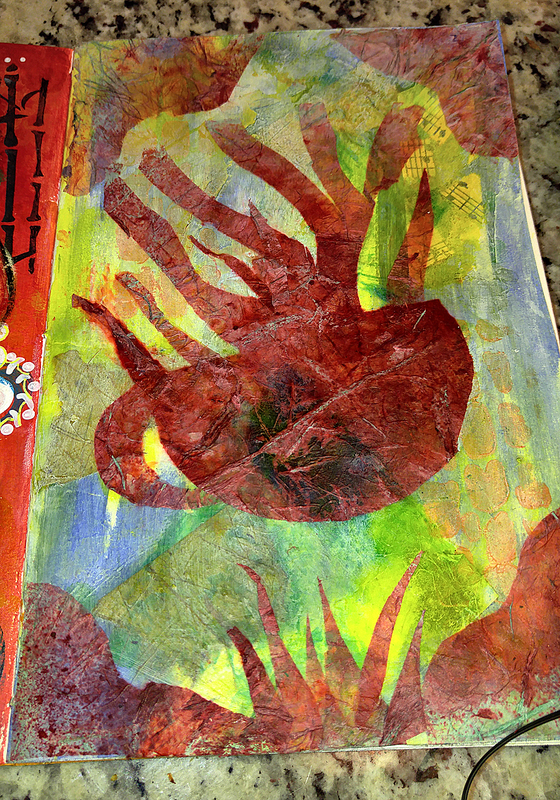 PS: If you enjoy mixed media and positivity, please join me in my private Facebook group here: https://www.facebook.com/groups/mixedmediatribe – the more the merrier!! Thanks Mimi! I love the fun ways the circles just POP with movement… and enjoyed your video, especially the bit about sneaking off for goodies ;-)! Yes, I’ll be happy to tag you again in the new year! And I loved that you included your doggie in the video! I might have to work my Rani Roo into mine in the New Year! Love your book and your pages so far! Beautiful! Thanks Cindy! I really enjoyed your tutorial and since I had an ample stash of handmade papers left over from a paper jewelry workshop I teach, it was the perfect element to work with. 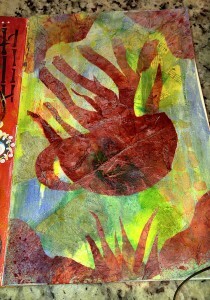 Also loved the spraying the papers with color ahead of time and then cutting shapes for collaging. The effects on some of the thinner pieces of paper were fun!